If you are the sort of person who likes to take on something a little more "out there" to raise money for your favourite good cause or charity then perhaps a bungee jump is the thing for you. Bungee jumping as an extreme sport started in 1979 and a few years later the first commercial bungee jumping began in New Zealand. The craze soon spread around the world and these days bungee jumping companies exist in most countries with adrenaline junkies testing themselves from bridges and towers in all sorts of locations. The dynamic visual appeal of bungee jumping soon came to the attention of fundraisers looking to find new and innovative ways to raise money for charity. The challenge of undertaking a charity bungee jump certainly seems to appeal to certain people and can be a great way to raise money for all sorts of organisations. Pay to attend a charity or corporate bungee day. Many companies offer these when a number of jumpers are given the chance to have a go. Sponsorship. With this jumpers collect sponsorship to cover the cost of the jump any excess raised being donated to their cause. Some larger charities have tie ins with some of the bungee jumping operators including pre-booked slots or whole days making it very easy to book a jump to raise money for them. There is no reason however that smaller groups cannot organise a day of bungee jumping for their supporters. Most of the bungee companies are very geared up for charity jumps and will advise you on how to maximize the revenue raising potential of your jumps and will possibly provide free marketing materials. Individuals can also easily book jump slots with most bungee companies. The figures are quite interesting. Undertaking a charity bungee jump is quite a dare-devilish feat and perhaps easier to attract sponsorship for. A jump will cost around £60.00 / $80.00 though you might be able to negotiate a better rate for a group booking. 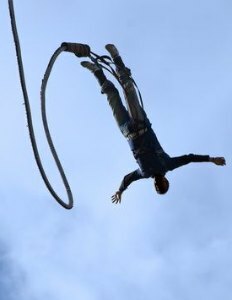 Bungee companies suggest that on average people will be able to raise sponsorship of around 3 times this amount (though some will do far better than that). Even with a deduction for the cost of the jump a group of jumpers can soon raise a substantial amount for their good cause. You obviously need to work with a reputable company and a google search will soon turn up a list of options. In some locations high bridges provide perfect bungee jumping stations. Otherwise to leap from a special tower crane is normal. These are usually at fixed locations but can sometimes be set up at your site if you were organising a larger fundraising event. 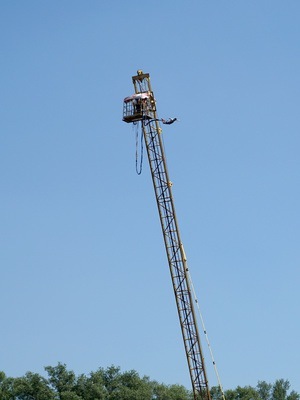 The usual height for a crane jump is 50m / 165ft. You don't need to stop there however - twice that height is possible! Need the support of your best mate? Tandem jumps are becoming increasingly popular. There are several ways to maximise your earnings from bungee. Filming the event and showing it to your supporters or club members can encourage extra donations if you take a bucket around. Posting your jump online can also elicit extra donations from friends and work colleagues. Also don't forget the power of a bit of friendly rivalry when it comes to raising sponsorship. A prize or at least bragging rights for the person who collects the most cash can encourage extra effort. So there you are a bungee jump for charity.